Besides announced SE Xperia neo, Sony Ericsson has also announced a new Android based smartphone which is known as Xperia Pro. The Xperia Pro has been combined intuitive and fast messaging with multimedia features for improve text-messaging experience.The Android smartphone is powered by 1GHz Qualcomm Snapdragon and runs on Android 2.3 Gingerbread. 3.7-inch capacitive touch screen with 854 x 480 resolutions. Touch phone with perfect slide-out keyboard and smart functions for fast messaging. Synch email and edit office documents while on the go. Sony Mobile BRAVIA Engine and Exmor R for mobile. Built-in HDMI – all pictures and videos can be shared on an HD TV. Ability to access more than 100,000 apps on Android Market. Access Google services for work or fun. 8-megapixel camera with LED flash and HD video recording capability. Comes with 8GB of microSD card and expandable up to 32GB. 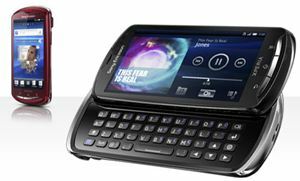 Available in black, red and silver, the Sony Ericsson Xperia pro is expected to be available in selected markets from end of second quarter. However, the price is not yet announced.